Alan Gentle, tireless leader of the Roxbury Center for Financial Empowerment, is well known in the neighborhood for managing our financial coaching program and one of the busiest tax sites in Boston. Recently, he was asked to put together a short video describing what we do at our 7 Palmer Street office, and we thought you would enjoy it. Remember, you can attend a free orientation at the RCFE office to learn what we do and sign up for financial and employment coaching! Drop in Orientation sessions are held at 10 am on Mondays and Wednesdays and the third Wednesday of each month at 6 pm. 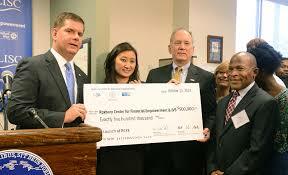 You can also participate in Boston Builds Credit free coaching at the Roxbury Center. ← Graduation time for the Bridge to Hospitality!